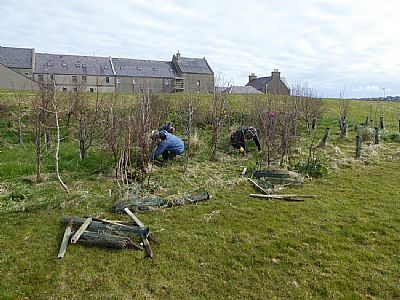 We are storing any reusable guards and stakes for use on any future woodland project and a big thank you to Jack Moodie for taking on the task of collecting and sorting through the many hundreds involved. The rough grass between the trees has been left deliberately (all the trees were planted with mulch mats to help prevent weed competition and young trees do not mix well with mowers, strimmers and herbicides). The added, and rather unexpected, benefit of this long grass, is that all these areas are now full of vole runs. Whilst this is very normal in more rural areas when grazing is removed, it did leave us debating how they found their way to the Peedie Sea. The Peedie Sea is a great asset to the town, not only as a good spot for a walk (and it is good to see it well used), but a place where you can watch many birds including getting very close-up views of Long-tailed Ducks and now maybe a fleeting glimpse of an Orkney vole. Once the trees grow further, there will also be some nice sheltered spots to sit.